I'm not one for hyperbole, but that fireworks display was truly AMAZING! One of the best I've ever seen (and I'm from China - we kind of invented them)! There is no doubt no-one was expecting what you delivered on Sunday and it has gone down sensationally. One letter even started …’Christ!’, another ‘wow, wow and thrice wow! The fireworks were absolutely wonderful And the drive fountains were a perfect way to end the evening. And you were a pleasure to work with, I wish all our vendors had been that easy!! 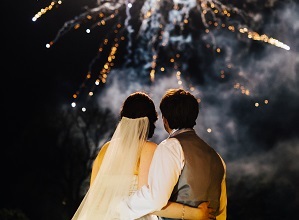 Wedding fireworks, November fireworks, New Years Eve fireworks, we can design and fire a wide variety of firework displays ranging from private wedding firework displays to main-event November public firework displays, all set to music if required, using our state of the art digital pyromusical firing system. Heritage Fireworks use only the latest electronic firing equipment. 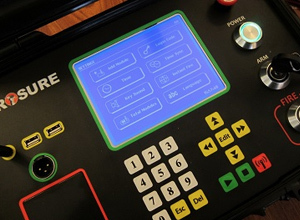 Each and every show, no matter what size, is designed on a computer before being transferred to our firing equipment and transported to site. 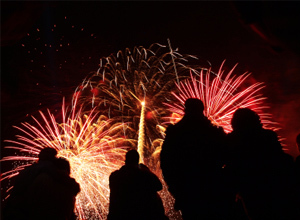 This means that we know exactly what needs doing well in advance – we can arrive, set up, fire, clean up, and leave in record time – all you see is the firework spectacular. We are based in Somerset and cover a large radius for all of our displays, call us to find out more. Do book early for larger November/New Year displays to avoid disappointment. Professionalism, Quality, and Safety – leave everything to us. We are dedicated to creating shows that amaze and delight – all under the umbrella of £10m public liability insurance. BUDGET STRETCHER DISPLAY ONLY £599! Fireworks don’t have to be expensive. For only £599 all inclusive you can now have a 6 minute professionally designed, computer fired display. This offer is only available within 40 miles of Taunton, Somerset. Further afield is possible with a mileage charge. 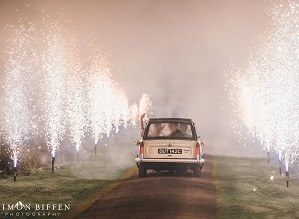 Fireworks are an unforgettable and magical way to round off an event. Nothing else leaves such an indelible memory. Whether it be a wedding reception, a private party, a public event, or a municipal November display, a well choreographed display with the option of synchronised music will be remembered and talked about for years to come. Fireworks simply have that “Wow!” factor like nothing else. The company you choose to provide your display makes all the difference. We are young, enthusiastic, professional, and above all, we love fireworks. We guarantee that you will get the best bang for your buck possible. Call or email us - you'll be surprised how affordable a professional display can be!